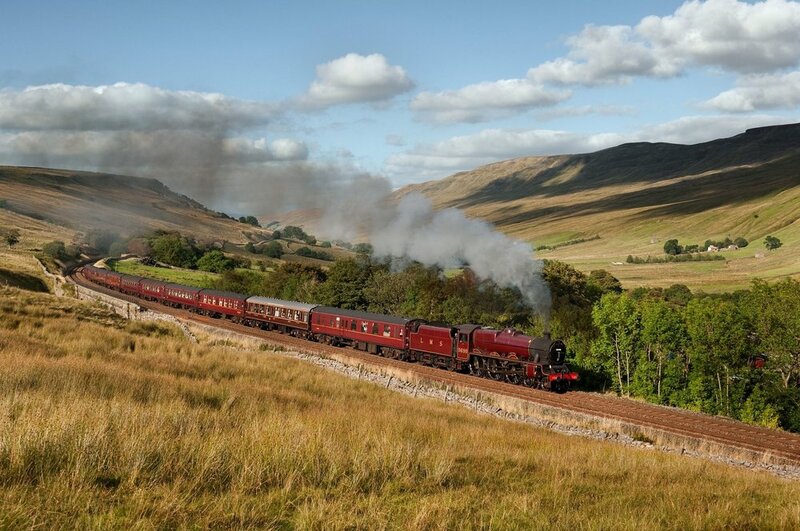 A pair of Stanier locomotives will haul two special railtours over the Settle-Carlisle line on August 11, to mark the 50th anniversary of the legendary ‘Fifteen Guinea Special’. ‘Jubilee’ No. 45690 Leander, or classmate No. 45699 Galatea, will haul the Railway Touring Company’s ‘Cumbrian Mountain Express’ over the S&C to commemorate the 50th anniversary since the end of BR standard gauge steam. On the same day, either ‘Jubilee’ No 45596 Bahamas or ‘Princess Coronation’ No. 6233 Duchess of Sutherland will haul RTC’s ‘Waverley’ railtour, setting out from York and picking up at Leeds, Shipley, Keighley and Skipton before crossing the Settle & Carlisle Line. “In 1968 thousands, sad to see the end of steam, gathered along the Settle & Carlisle route to watch the passage of the BR ‘Fifteen Guinea Special’,” said the Railway Touring Company’s MD Nigel Dobbing. “Fortunately, a number of fine steam locomotives were saved from the scrapyard and it’s wonderful to see these magnificent feats of British engineering still at work on our railways hauling steam specials,” he said. Booking is necessary. For details visit the Railway Touring Company at www.railwaytouring.net, or call 01553 661500 for a brochure.